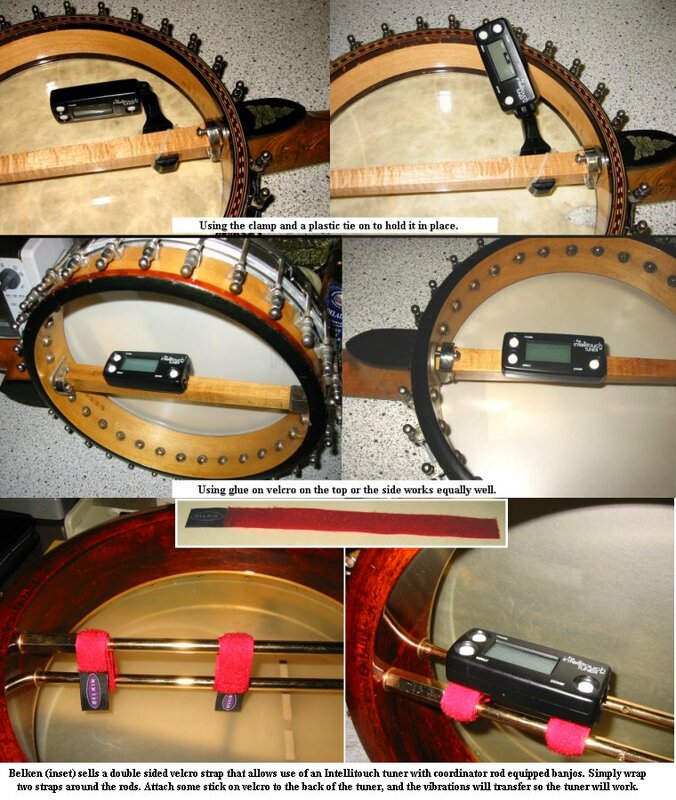 Attaching an Itellitouch tuner to an open back banjo. Vega Banjo Mandolins. 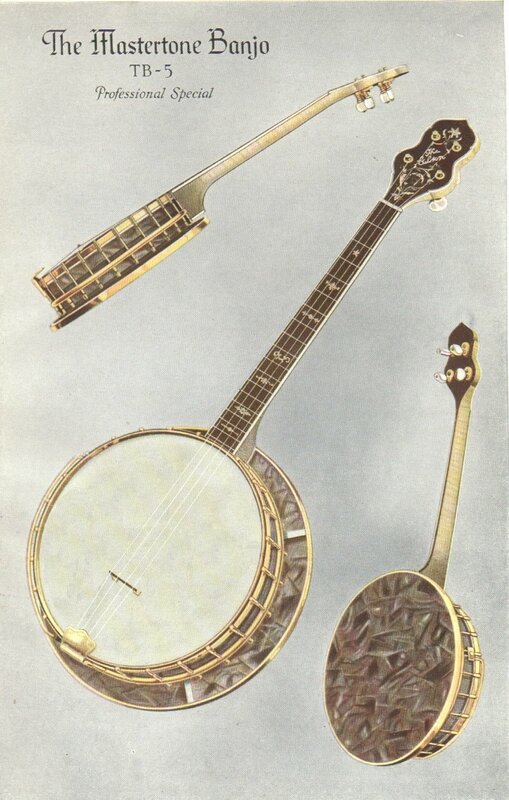 1920s catalog pictures of "Style K" 4-string & 8-string banjo mandolins. Both models were available in all Vega's style levels. Some other makers called their 4-string banjo mandolins "lead banjos." 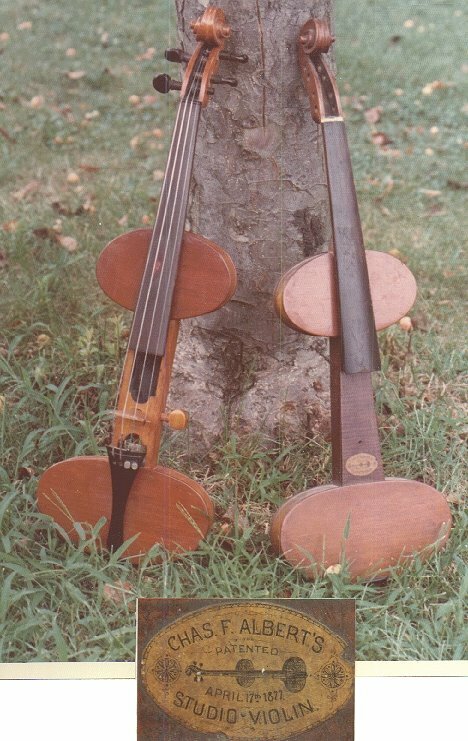 Albert Studio Violins. Rare 1870s studio or practice violins by Charles F. Albert, Philadelphia, PA. Note the "5th peg" on the one on the right. It allows the user to change the height of the bridge. Fancy Troubador banjo pegheads. Two Washburns and two Slingerlands. Note that the Washburn troubador is playing an instrument with 4 tuners in the peghead while on the Slingerlands he appears to be playing a guitar with 6 tuners. Inside S.S. Stewart's factory. 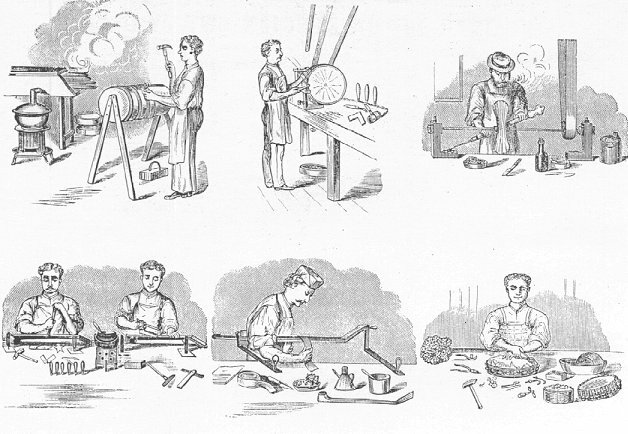 From an 1890s drawing. 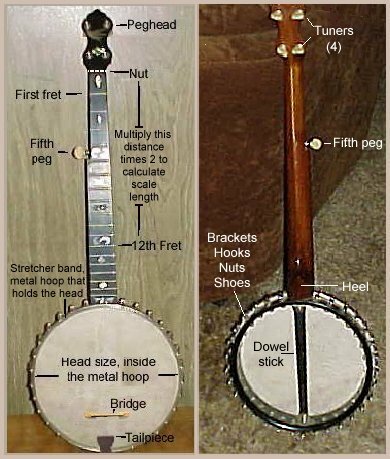 Banjo measurements, useful when trying to describe to the banjo novice where to measure. Circa 1924 Vegaphone Deluxe 5 string banjo screen background. First click on the underlined text, then right click the image, save the image in your Windows directory, right click a bare spot on the desktop and choose "Properties-Background-VegaDeluxe" then under "Display" choose "Tile" then click "OK."
Mid to late 1860s fretless with inlaid fret markers, 12" head. Concert Grand Autoharp. 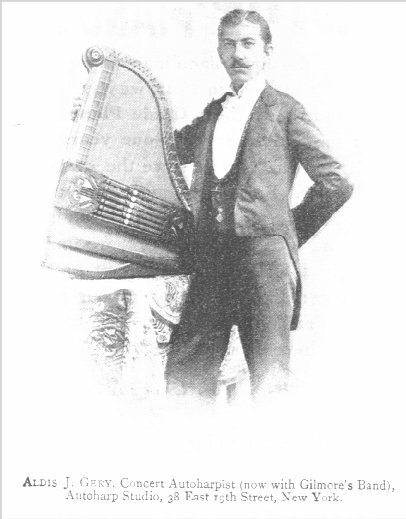 Aldis J. Gerry, 4/1895, with Autoharp by Alfred Dolge (bought Zimmermann in 1892). 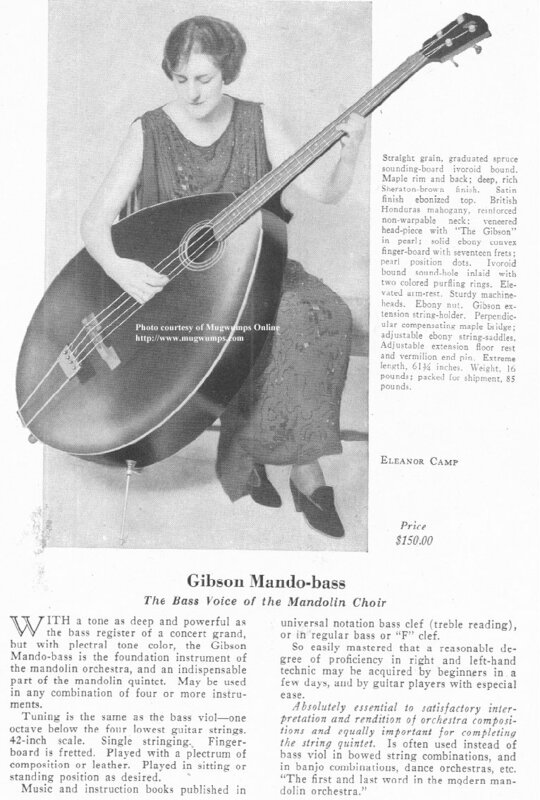 Gibson mandobass from the 1927 catalog. Note the two holders for the end pin, one on the side and one at the bottom. 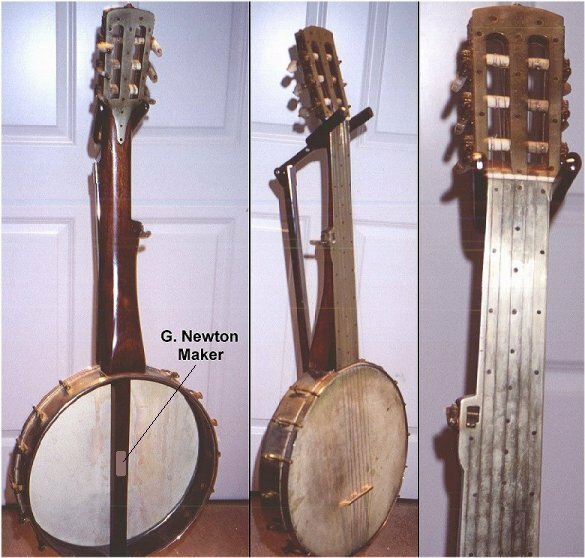 Old Ironsides Marked "G. Newton, Maker" on metal plaque screwed to strut, 7 string fretless, c1880s. 12 inch rim, solid nickel silver, no wood; nickel silver fingerboard, peghead front back and sides, all held on with many, small, nickel silver screws. Brass hooks, nuts, and shoes. Click to see tuners. Maker information gratefully accepted. The Weavers, 1951. 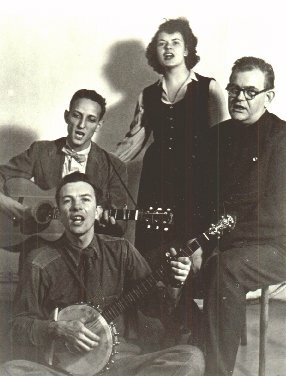 Fred Hellerman, Ronnie Gilbert, Lee Hayes, and Pete Seeger w/regular necked Orpheum Style 1. The Capo Guitar. At the turn of the century, Sears offered the ultimate answer as to whether one should use a capo. Patented in 1902 by Ernest R. Kappeler of Allegheny, PA, it was built by Harmony and sold by Sears. J.B. Schall turn of the century ad for a 4 string tenor-banjo that he called the "Tango Banjo." John Farris patented banjolin, c. 1885. 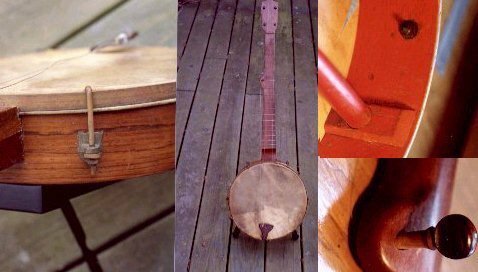 Probably the first "tenor" banjo, it was tuned EADG, as the ad states. 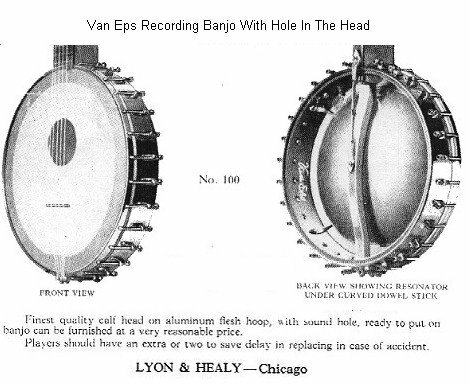 Van Eps Recording banjo, showing the "hole-in-the-head" design. 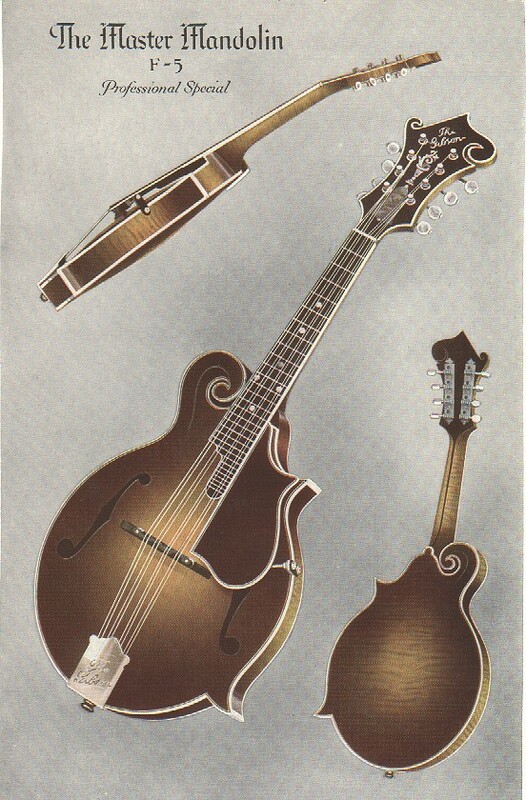 Gibson F-5, The Master Mandolin from their catalog "P" circa 1927. 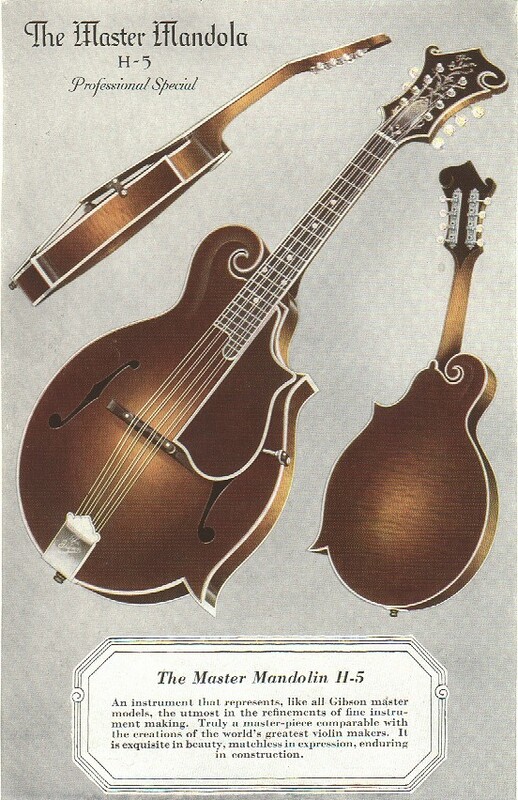 Gibson H-5, The Master Mandola from their catalog "P" circa 1927. Gibson TB-5 Professional Special, The 1923-24 Mastertone pictured here was a gold-plated, transitional model between the earlier, open backed ones and the eventual flanged design, introduced in 1925. Gibson called their Pyralin covered accessory a "tone projector back." Very few of this model were made.